There is no judicial workload crisis. U.S. Supreme Court Associate Justice Neil Gorsuch takes the judicial oath as President Donald Trump looks on during a ceremony at the White House on April 10. A version of this piece was originally published on Shugerblog. If conservatives get their way, President Trump will add twice as many lifetime members to the federal judiciary in the next 12 months (650) as Barack Obama named in eight years (325). At times, Calabresi and Hirji are forthright about their motives. On the first page of their memo, the first header trumpets: “Undoing President Obama’s Judicial Legacy.” But most of their memo emphasizes an unprecedented “crisis” in judicial workload. “Caseloads have reached unprecedented levels,” they write, citing “a crisis in volume.” Apparently, the sky is falling, and Calabresi and Hirji just happened to notice now that Trump is in office. The Calabresi-Hirji memo is misleading about the facts of the federal judiciary, though. There is no workload crisis whatsoever. 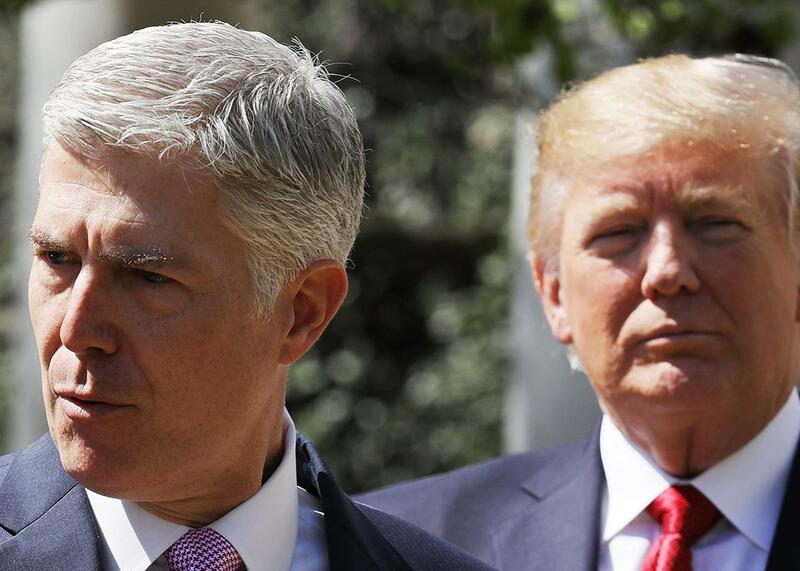 The Garland-to-Gorsuch Supreme Court switch is the most visible example of this tactic but far from the only one: Due to GOP obstruction, “the number of [judicial] vacancies … on the table when [Trump] was sworn in was unprecedented,” White House Counsel Donald McGahn recently boasted to the conservative Federalist Society. Trump is wasting no time in filling the 103 judicial vacancies he inherited. In the first nine months of Obama’s tenure, he nominated 20 judges to the federal trial and appellate courts; in Trump’s first nine months, he named 58. Keep in mind whom Trump has nominated for these seats from his Federalist Society pipeline. Brett Talley, a breathtakingly inexperienced lawyer who failed to disclose that his wife works for White House counsel (and near-certain Russia-investigation target) Don McGahn, allegedly posted inaccurate defenses of the early Ku Klux Klan. To date, Talley has offered no defense for these KKK-sympathetic posts, and the Federalist Society is conspicuously silent about their member’s explosive comments. Thomas Farr allegedly helped intimidate black voters in 1990 with postcards threatening prosecution for good-faith voting errors. John Bush was a birther conspiracy blogger who reposted implicit threats of violence. Jeff Mateer said transgender children were evidence of “Satan’s plan.” The list of nominated horribles goes on and on. In fact, [our proposal] is a court-unpacking plan. It counteracts Democratic court-packing under President Carter and a Democratic Congress in 1978, which increased the size of the federal courts by 33 percent … This [workload crisis] is a national scandal of epic proportions, which Congress should and could address by increasing the size of the federal courts of appeals and district courts by 33 percent, as Jimmy Carter and a Democratic Congress did in 1978. If what Carter and the Democrats did in 1978 was permissible, then what we propose is permissible as well. This is misleading “whataboutism.” Richard Primus addressed part of their argument with details of the passage of the 1978 statute, describing how the Carter proposal had been enacted to address actual demographic shifts in specific circuits. The litigation statistics did reflect a huge caseload increase in the 1970s but show no crisis today. The Federal Judicial Center, the research and education agency of the judicial branch, tracks judicial workload over the past century. Here is what their actual records show: a dramatically sharp increase in appellate cases from the 1960s to the early 2000s and then a drop over the past decade. Civil suits rose steadily from the 1960s through the 1990s and have leveled off since then. Total nonbankruptcy filings increased rapidly starting in the late 1960s through the late 1980s and also leveled off to a flat steady line. [T]he statute was not a partisan or ideological power play. In both Houses of Congress, most Republicans supported its passage. (Or, strictly speaking, we know for sure that that was true in the House, where there was a roll-call vote. In the Senate, the measure passed by voice vote, which suggests that it wasn’t a highly contested question.) The point here is just that although it’s true that a prior bill passed by a majority-Democratic Congress and signed by a Democratic President expanded the number of circuit judgeships by 36%, it would be a mistake to infer that that bill, like the one Calabresi and Hirji propose, was an effort to seize ideological control of the lower courts. There was indeed a workload explosion from the FJC’s statistics. From 1968–78, the number of nonbankruptcy cases almost doubled (from 100,000 nonbankruptcy cases to about 180,000), and the number of appeals almost quadrupled. It’s also worth noting what is so striking about these numbers: After such a dramatic increase in caseload over the late 20th century, this problem has been overcorrected by making it far too difficult for individuals to get their day in court to protect their rights. In 1996, Congress “fixed” the workload problem by passing a series of statutes that created enormous obstacles for prisoners and immigrants. Now prisoners are blocked from asserting their constitutional rights through changes to habeas corpus. Congress and the Supreme Court are cutting back on access to justice through civil-procedure reforms, including limits on class-action litigation, jurisdiction, and pleading standards. Consumers have always had a difficult time challenging big banks and big business, and Congress just made it a lot harder. So there are several ways Calabresi and Hirji have it all backward. There is no judicial workload crisis. They have conveniently attempted to manufacture one in 2017, after conservatives acted as if there were too many judges on the bench in the Obama years. Beneath a fiction of a “caseload crisis,” Calabresi and Hirji actually want to deepen an access-to-justice crisis by helping Trump make access to justice even worse for average Americans.